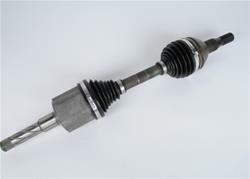 Axle Length (in): 25.750 in. Notes: Features 21.350 in. compressed length. ACDelco CV axle drive shafts are designed to transfer torque from your vehicle's transmission or differential to its wheels, and are GM-recommended replacements for your vehicle's original components. The axle shafts have constant velocity (CV) universal joints at each end to allow your wheels and suspension to articulate properly. These OE-style CV axle drive shafts are manufactured to fit GM vehicles, providing the same durability, performance, and service life you expect from General Motors. Order the model designed for your application.